Even under the most ideal circumstances it can be difficult to stay afloat at work with all of the tasks that you’re responsible for completing in a day. Add the mucky waters of office politics to the mix, and you might find yourself drifting so far from shore that you’ll never get back. It might have a negative connotation, but office politics isn’t inherently a bad thing. Certainly, it has shown itself as problematic at times, but politics can also be a way to give yourself a leg up, help the company and avoid conflict by balancing diverse (and potentially hostile) views in a team to keep everyone working positively and productively. No matter what, if you’re working in an office, you’re going to experience office politics. Therefore, you’ll be a happier if you learn how to maneuver through the rough patches and create alliances to avoid the drama and excel in your career. The first thing to learn in office politics is that there is power in numbers. Without solidarity you’re just one person against a much larger group. But that doesn’t mean that you have to have the entire office behind you. Business isn’t a democracy. Most are hierarchical, and it’s that upper echelon you should influence foremost. According to Forbes, you’re more likely to wield power in an office setting if you are supported by quality and diversity, rather than just a large group. That’s because, if you’re aligned with those in a position of power, you’ll be more influential and gain greater insight into the workings of the office political system. Offices are structural organizations, and the more connected to the different parts of that structure you are, the more you have a map of the landscape and the ability to move through it without snags. Therefore, you must approach these networking opportunities strategically. Where are your strongest and weakest connections? Who do you need to connect to in order to strengthen your overall ties to the company? Who can offer you the greatest insight or introduce you to these people of power? It might sound Machiavellian, but there’s no reason to make this an exercise in deceit and trickery. You’re working to help a company make money. The better situated in that organization you are, the more productive you’ll be. It’s a matter of showing enthusiasm and working with others for the greater good. Work is not a charity, unless you’re working for a nonprofit, but even then nobody’s going to go out of there way to help you succeed. Whenever money is involved people generally become mercenary. They need to keep a roof over their head and feed themselves or a family, so it’s understandable why people get a bit cutthroat. Therefore, you must be an advocate for yourself, but that can be a tightrope to walk. Be too assertive and you come across as aggressive and more interested in yourself than the overall success of the project. On the other hand, be too timid, or even too nice, and people might walk all over you and take credit for your hard work. The last thing you want to see is another person rising the ranks because of your labor. That’s not fair, and office politics at its best should be about equality. So, how do you strike that balance of asserting yourself quietly? According to Psychology Today, there are several ways. For starters, if you’ve written a report, email the draft to your colleagues to get feedback, and be sure to thank them for their help. In a meeting, wait until near the end and then acknowledge everyone’s good input, and use their contributions as a springboard to make your own point. You can also volunteer to do more work, but only if you’re able to do so well and not overburden yourself. For example, tell your superior that you want to take on a special project that can use your unique strengths and skills. That keeps you visible and helps both your supervisor and the company. Sometimes the course is not clear, and you don’t know what to do in a situation. What is the right move politically? Well, sometimes you need to stop thinking strategically and seek a deeper counsel. At least that was the advice offered by Franke James, editor of OfficePolitics.com in the pages of The New York Times. She said that people should use their intuition more. To do that, she suggested being more aware of their work environment. People are constantly picking up clues around the office without even realizing it. By being more attentive to what’s around us in the office and those interrelationships, we can take the right action without having to think of everything like a chess match. We’re constantly taking in more than we can consciously digest. Mostly, we’re all working on a very superficial level. We just follow the words that are spoken, which makes sense. Language might not be the most accurate means of communication, but it’s the best we’ve got. Think of how misunderstood emails and texts often are. That’s because they’re often not in context and lack tone. When you’re physically with a person, you’re picking up unconsciously on their body movements, facial expressions, tone in their voice and even the smells in the air around you. All that goes to color the conversation in a way that adds a greater depth. You’re responding to it, whether you know it or not. 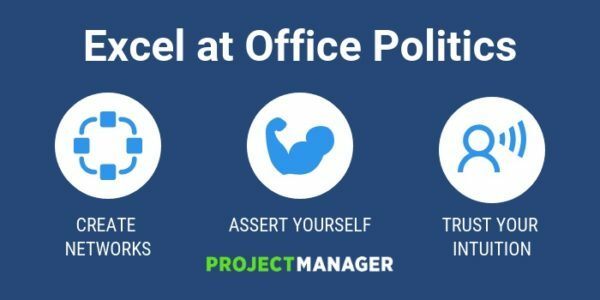 The more you can actively tap into that full expression, the more you’re going to excel at office politics and know where to make your next step without stepping on toes. Allow yourself to trust yourself. You’ll know instinctively when you’re doing something right or wrong in terms of the office politics. As you continue to assert yourself, read social cues and trust your instincts, your confidence will grow. That confidence will be palpable, and other around you will begin to have more faith in your actions and assertions, letting you navigate the office with the ease. Office politics can be a hard road to travel. You’ll likely have to drudge the extra-mile to prove yourself, and sometimes that means actually working! If you’re using an online project management software like ProjectManager.com, you’ll have the tools to get more done and be a standout professional. See for yourself by taking this free 30-day trial.